On April 6, 2017, the Jordan Center for the Advanced Study of Russia hosted Maria Cristina Galmarini-Kabala, Assistant Professor of History at James Madison University. 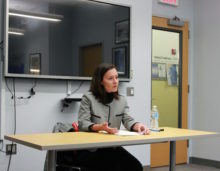 As part of the Colloquium Series, participants discussed Galmarini-Kabala’s paper, titled “The Violence that Makes Children ‘Psychically Sick’: Wars, Medical Diagnoses and Everyday Life in a Soviet Psychiatric Institution,” a “micro history” of the Child Psycho-Neurological School-Sanatorium that operated in the city of Perm between 1926 and 1929. Jane Burbank, Professor of History at NYU, started the discussion off by addressing Galmarini-Kabala’s “big question,” namely whether violence was the right framing for the material at hand, especially since the paper made it evident violence happened in certain ways inside and outside the institution. Burbank also asked about the outlying prominence of [Anton] Makarenko, perhaps the most famous Soviet pedagogue, and the subject of the 1955 film Road to Life. Galmarini-Kabala recommended Dorena Caroli’s analysis on the subject, which she said demonstrates that Makarenko became famous afterwards, not as he was doing his work. “A myth was created around him as ‘fixing’ these children,” Galmarini-Kabala said, even though until the 1930s, when the Commissariat of Health began to fund these institutions, it was the Commissariat of Internal Affairs that had more of a say in dealing with “morally defective” children, and unlike the pathologists who wanted to reform the children, for Makarenko it was about discipline. Anne O’Donnell, Assistant Professor of History and Russian & Slavic Studies at NYU, inquired about the children in the Sanatorium: who were they and what was the nature of their issues? Even if they had structural psychological issues, O’Donnell said, because the language in the paper is “ultimately of morality,” it led her to question if the failing of the children was social. Especially considering the socio-economic conditions of the period, this also brought up the question of whether being in the institutions was a privilege. Indeed, Galmarini-Kabala said, considering the alternative, the orphans were privileged to be there. The other children were privileged in the sense that by being inside, they avoided starvation, homelessness and criminals. On the other hand, they were free to leave, unlike those children that were sent there by their parents, some of whom believed in social vospitanie, where the state shares the responsibility of bringing up children with the family, and some of whom were simply unwilling to deal with children. Overall, “it was a very heterogenous group of children,” Galmarini-Kabala said. Sam Casper, Jordan Center Writer in Residence, posed another “big picture question,” namely if there is “anything distinctly Soviet about these children and their predicament,” since, he pointed out, much of the story is reminiscent of industrialized/industrializing countries in the aftermath of the war. In the therapies offered at the institution, Casper added, it was not exactly clear if anything was pitched or phrased in terms of Marxism-Leninism. “Was there an imperative there to give these kids socialism?” Casper asked. Kotsonis also said that he found it interesting to think about a discipline “torn between accommodating the person as they are and bending the person to fit the system.” It very much sounds like what we do here, he said.